Spain is very proud of its jamón iberico, and rightly so. The cured ham is made from a special breed of pig (known simply as iberico in Spain, but abroad often called pata negra because of the black hooves) and the best quality is fed with acorns (bellota). Jamón iberico isn’t cheap, so when you order croquetas de jamón there is usually only a small amount of jamón in them and not of the bellota quality. 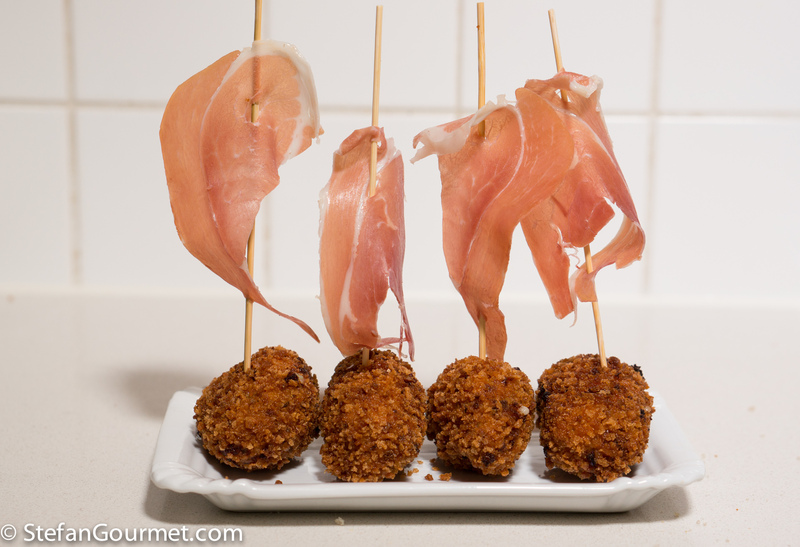 But when you make them yourself and use a generous amount of good jamón, your croquetas will be divine. 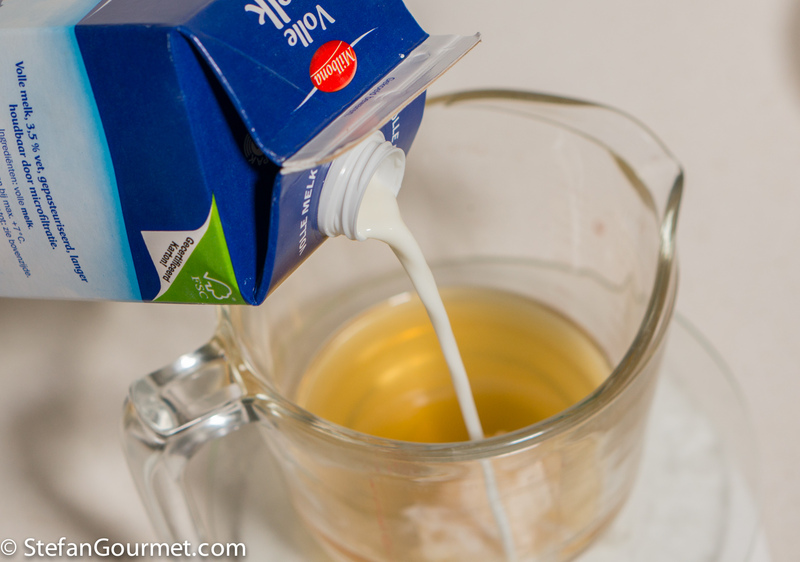 Another trick to improve the flavor is to replace part of the milk with pork stock. 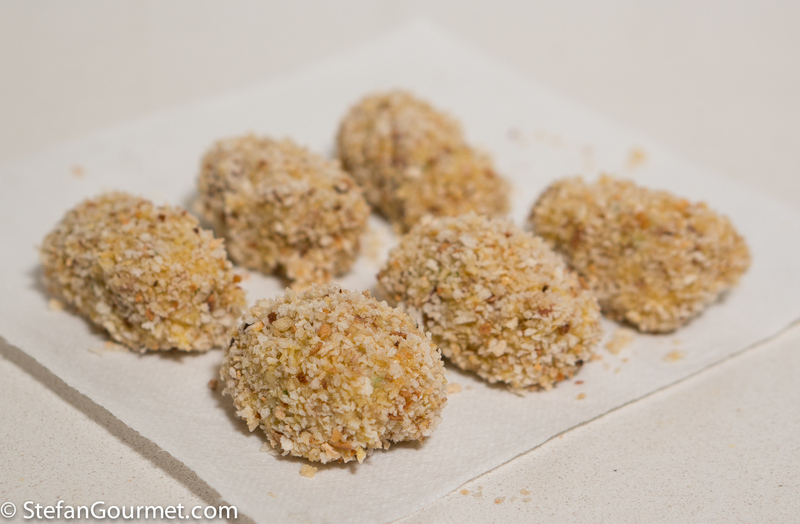 Otherwise, the preparation of these croquettes is very similar to mushroom croquettes. In Spanish bars they are usually warmed up in a microwave before serving, but of course they are even better when they are freshly fried and still crispy. 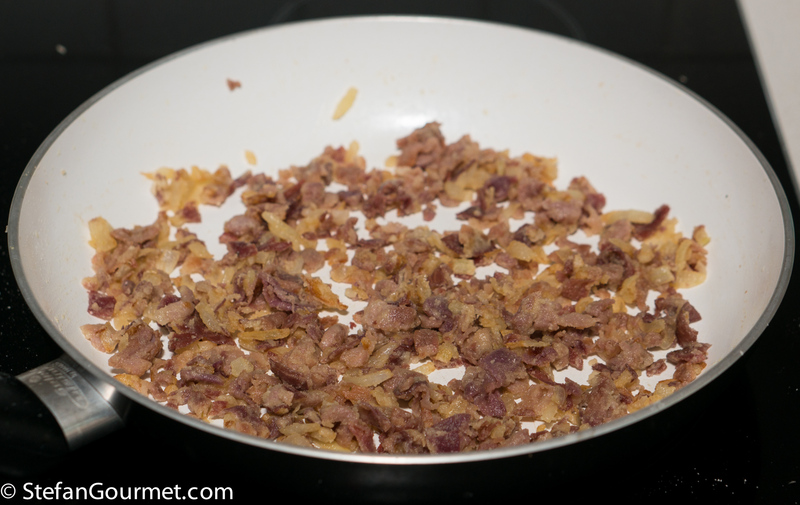 They will be even more crispy if you use coarse breadcrumbs for the outer layer. 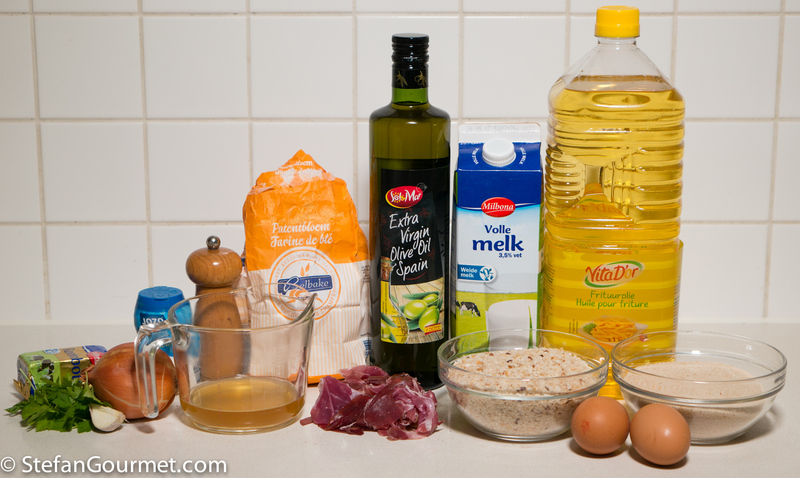 Below I will explain how to make coarse breadcrumbs yourself. 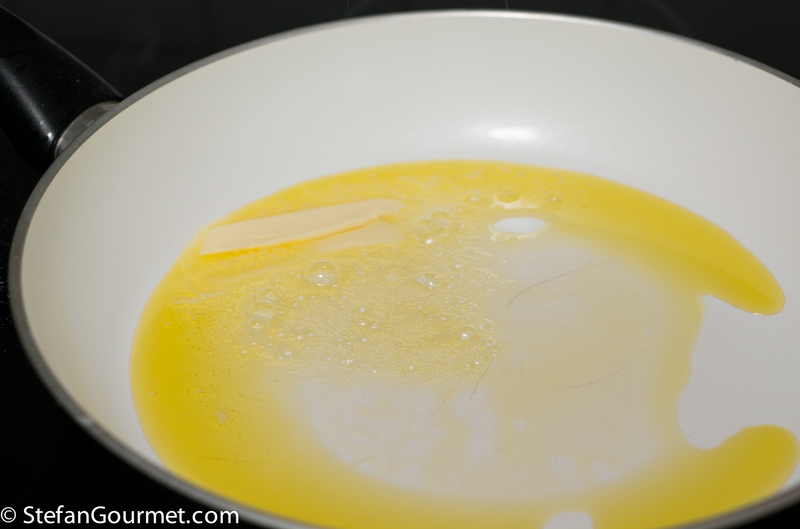 Heat 3 Tbsp olive oil and 3 Tbsp butter in a frying pan. 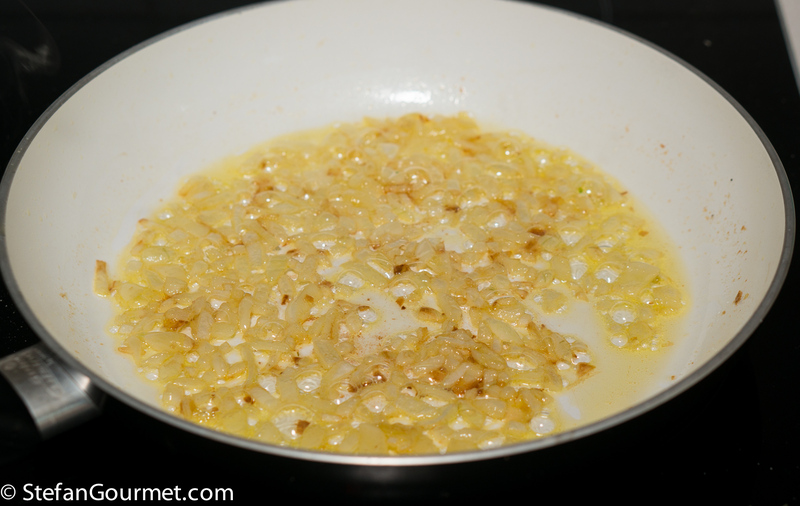 When the butter foams, add a minced onion and stir over medium heat until the onion is soft and slightly golden. 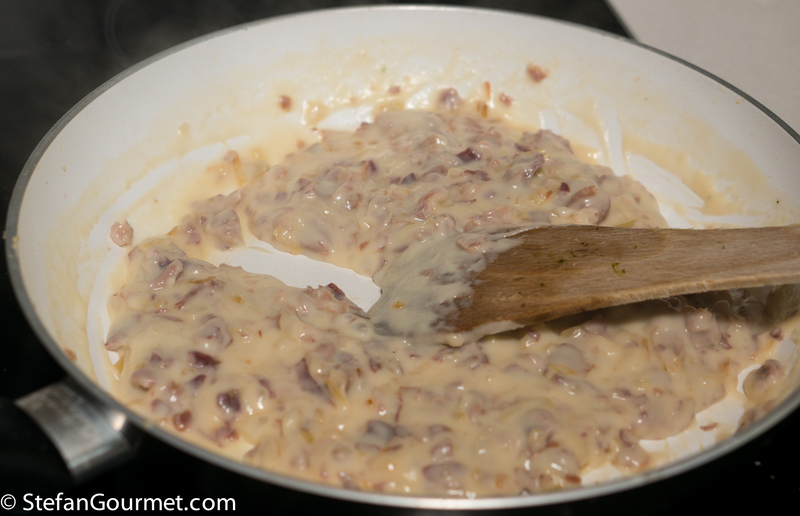 Meanwhile, combine 250 ml pork stock with 500 ml whole milk and heat this in the microwave or on the stovetop in a small saucepan. The mixture should be not but not boiling. 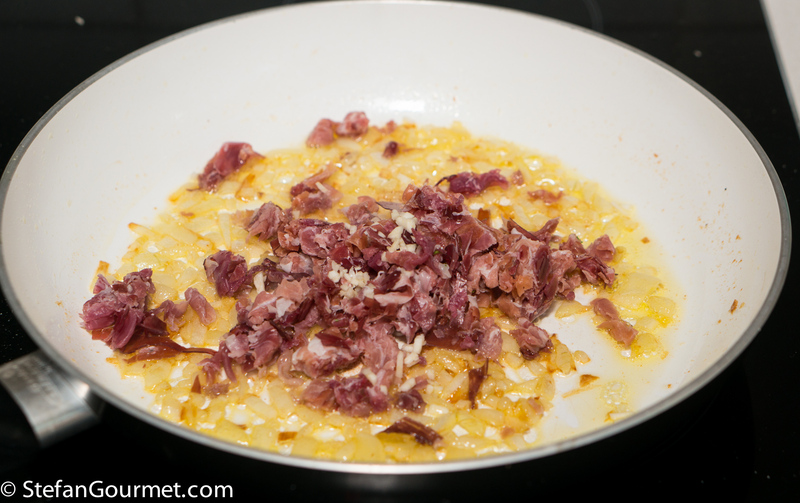 When the onion is slightly golden, add 250 grams of jamón and a minced clove of garlic. 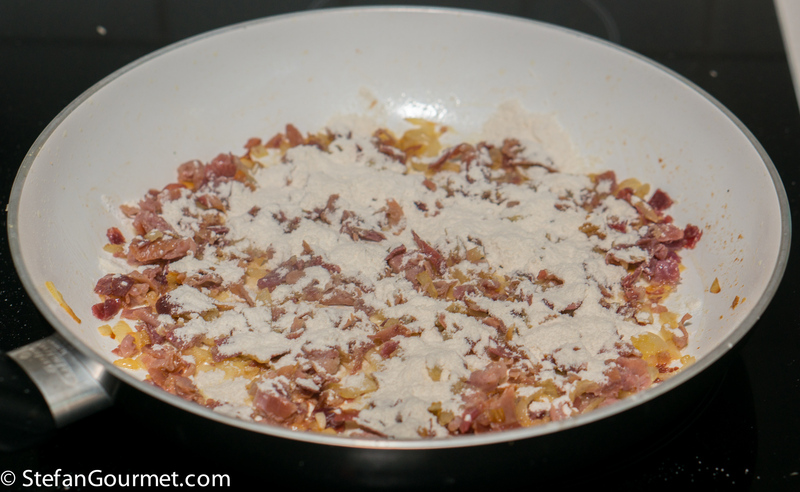 Sprinkle with 9 tablespoons of flour. Stir for a minute over low heat. 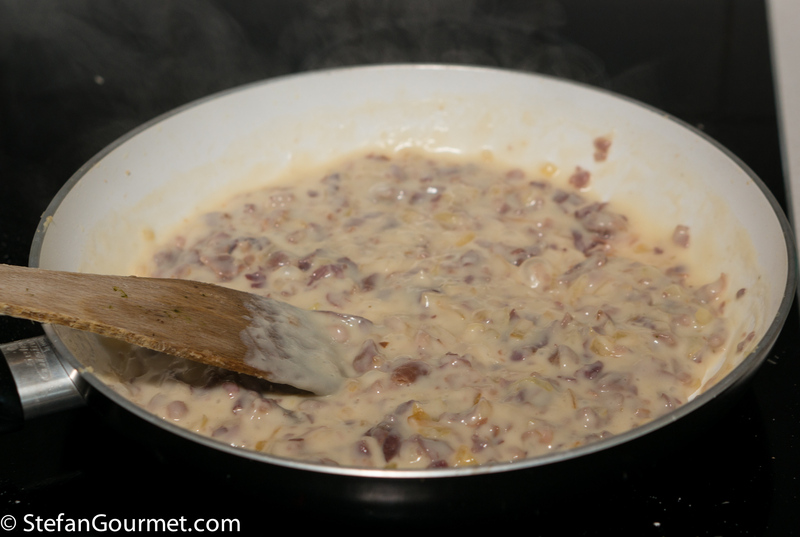 …until the mixture has thickened. 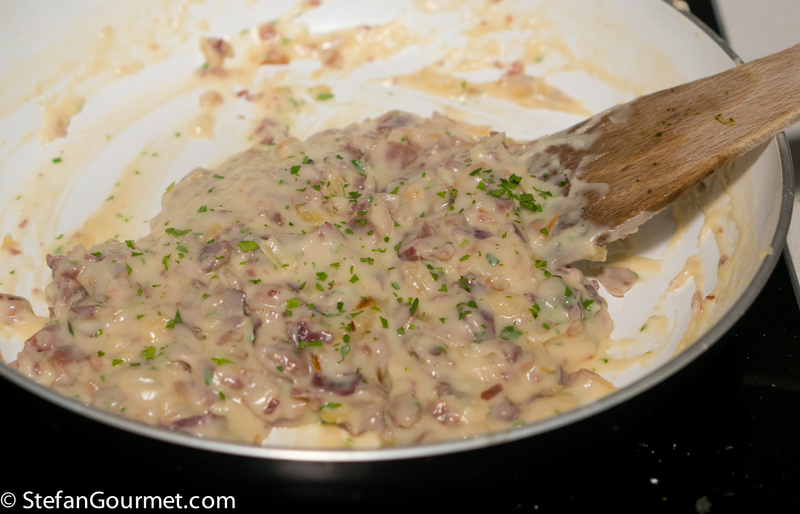 Add a tablespoon of minced parsley and stir to incorporate. Taste and adjust the seasoning with salt and freshly ground black pepper, taking into account that the ham is already quite salty. 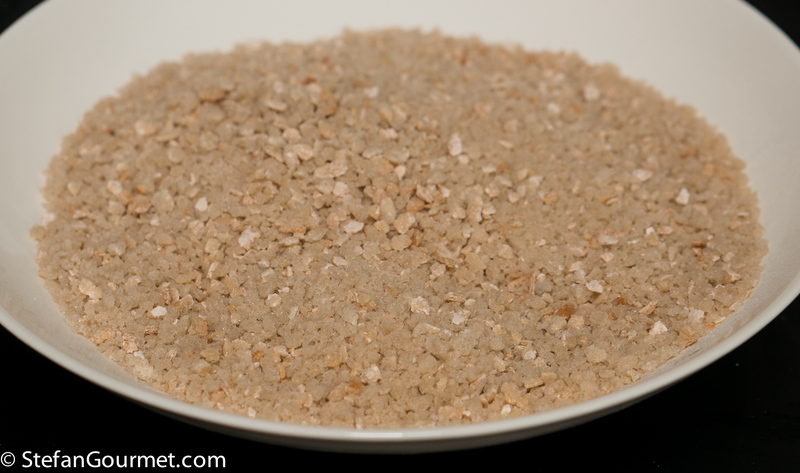 To make coarse and fine breadcrumbs, grind dried bread in the food processor. The bread can be dried in a low oven or by arranging sliced bread in a single layer and leaving it for a week or so (if your climate is not too humid). 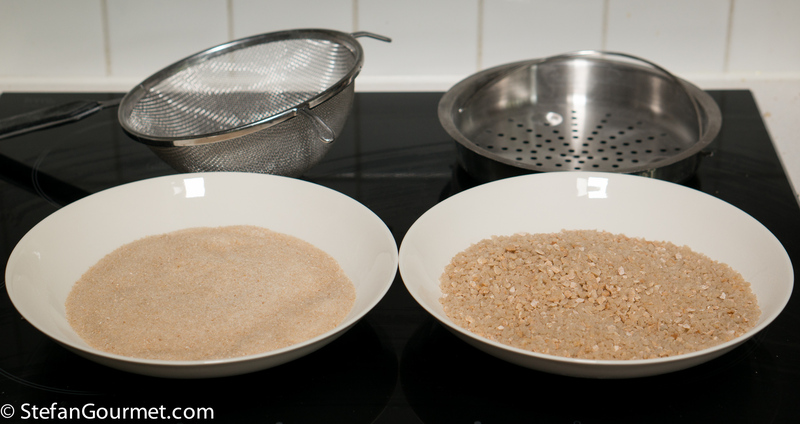 First use a fine sieve to obtain fine breadcrumbs. 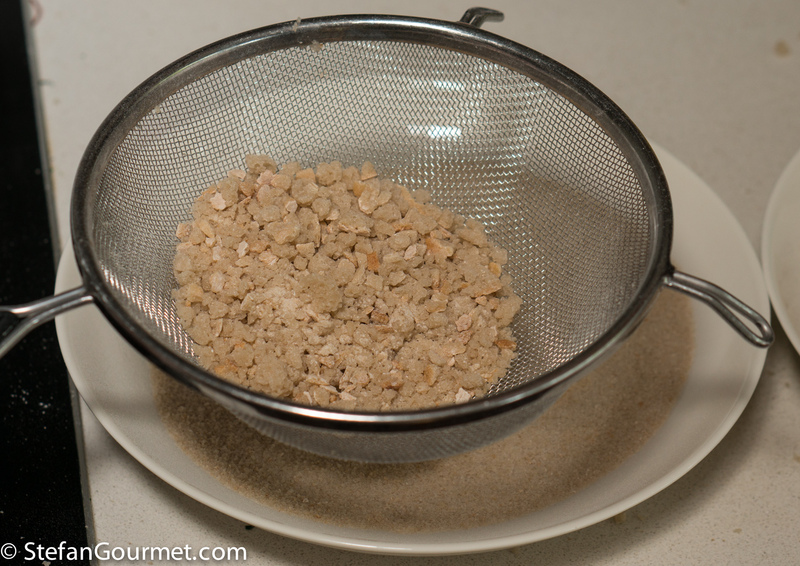 Then use a coarse sieve to obtain coarse breadcrumbs. 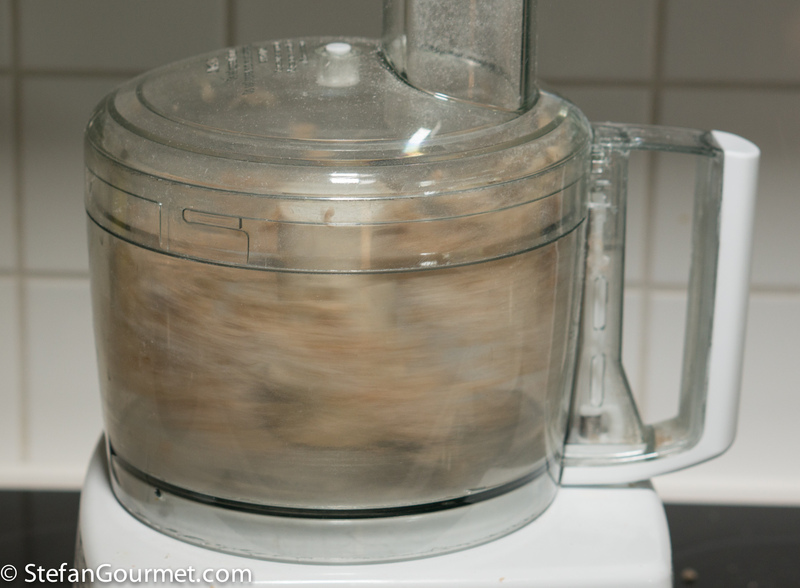 Return any larger bits that are leftover to the food processor and repeat the process until all the bread has been transformed into either fine or coarse breadcrumbs. 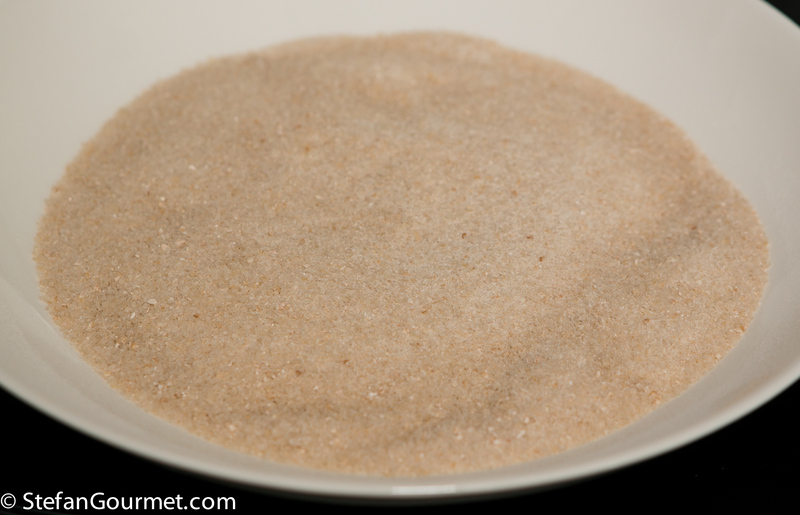 …and the coarse ones are coarse. 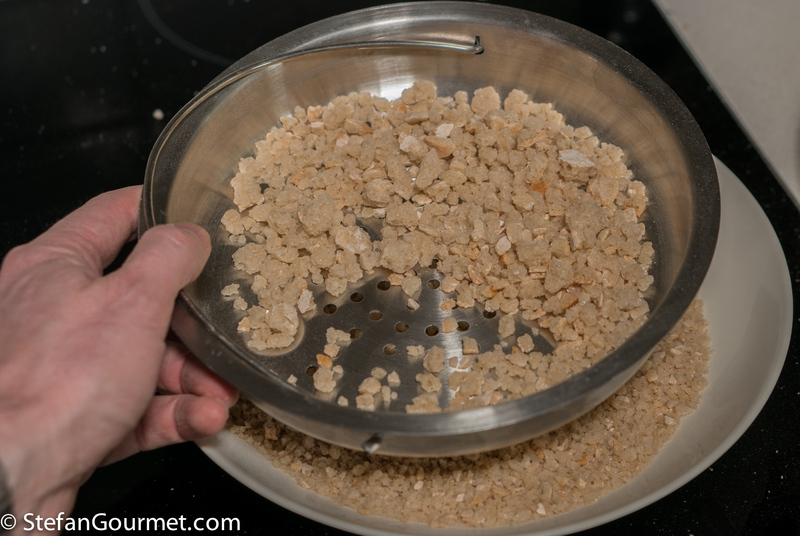 Set up an assembly line of (fine) breadcrumbs, beaten egg, and (coarse) breadcrumbs. 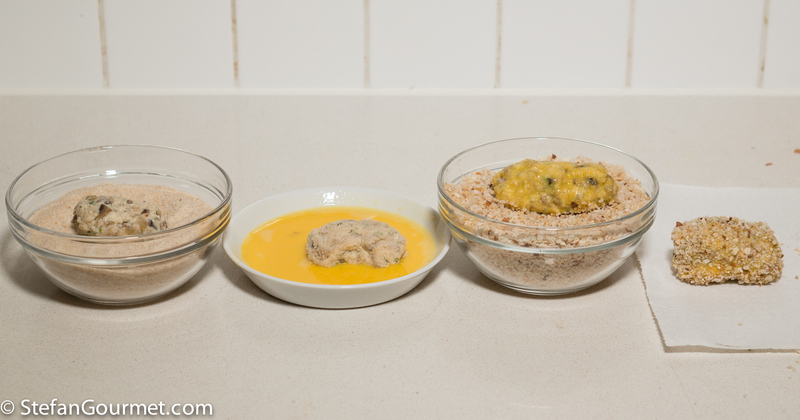 Take an egg-sized piece of the mixture, shape it with your hands into a ball or slightly oblong shape, and then cover it first with (fine) breadcrumbs, then with egg, and finally with (coarse) breadcrumbs. Make sure each layer covers everything, or your croquettes will leak. 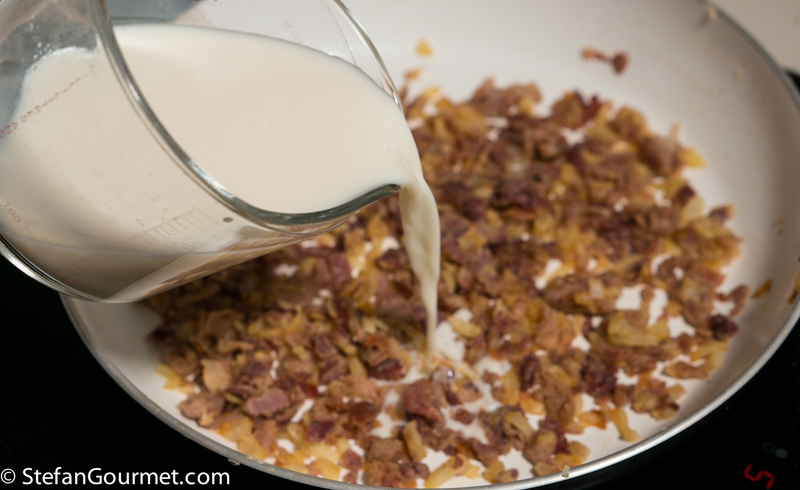 Repeat until you have used up all of the mixture. 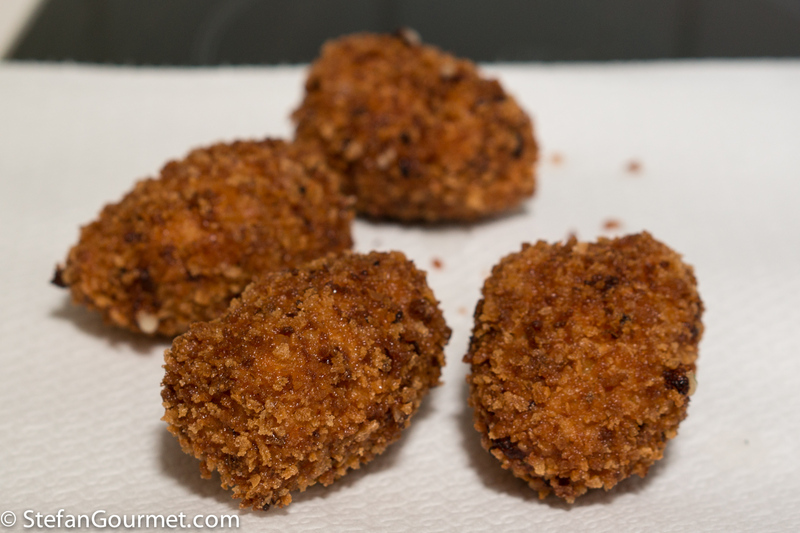 Deep fry the croquettes in oil of 180C/350F until golden brown. 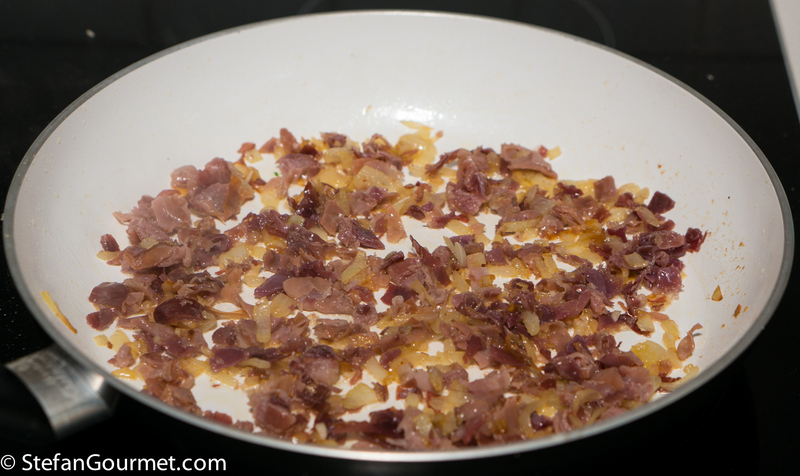 Fry them in batches, so the temperature of the oil does not drop by too much. 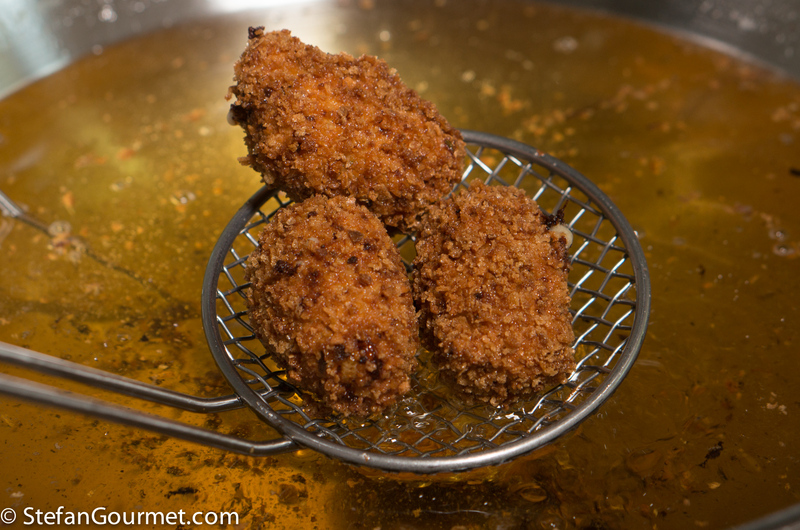 If you manage to keep the oil temperature close to 180C/350F, the croquettes will hardly absorb any oil. Allow them to drain on paper towels. 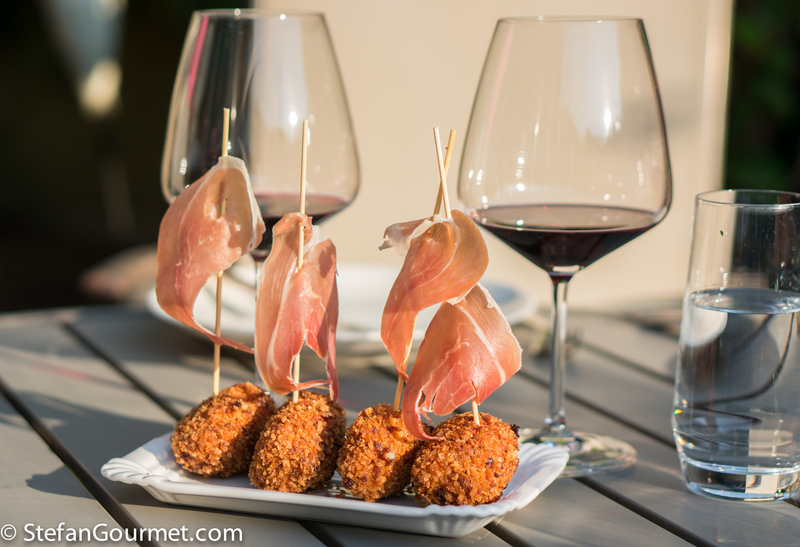 At tapas bars in Spain the croquettes are often displayed and served with a ‘sail’ of ham. 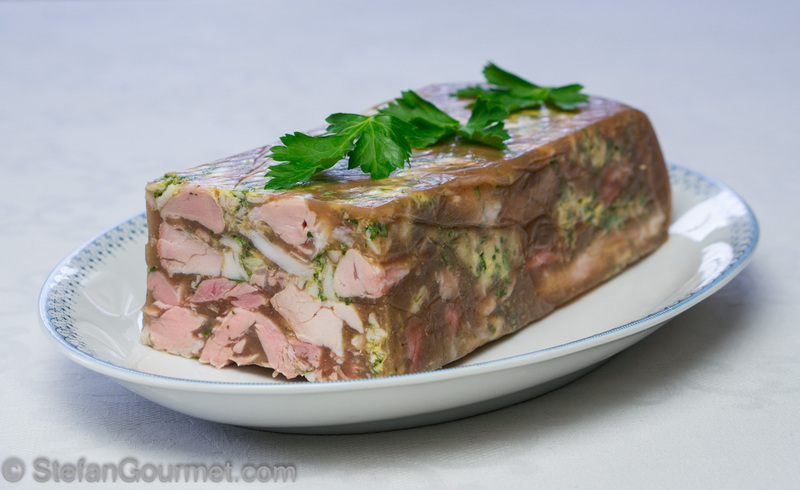 Jambon persillé is a terrine of ham hock (pork shank) with parsley. It can easily end up a bit dry and bland. 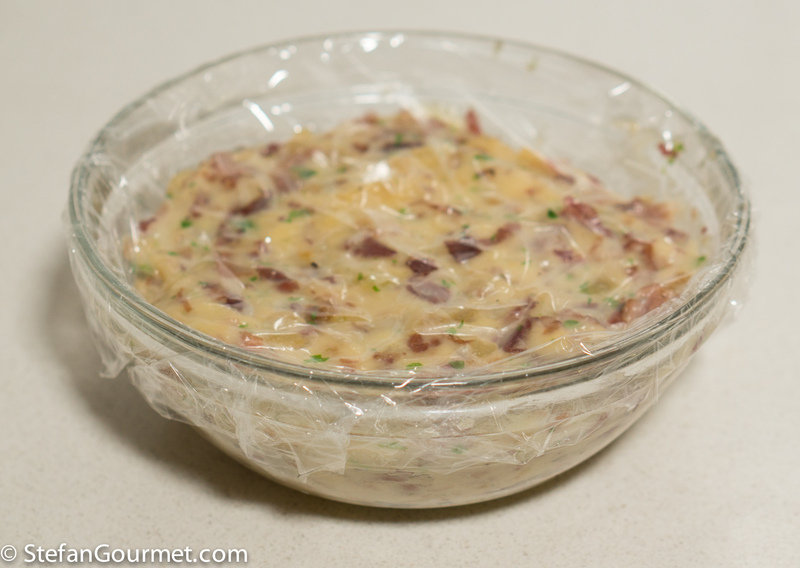 But when cooked sous-vide using a stock made from pork trotters, it becomes a real treat. That looks amazing. The perfect tapas! I love the sails! 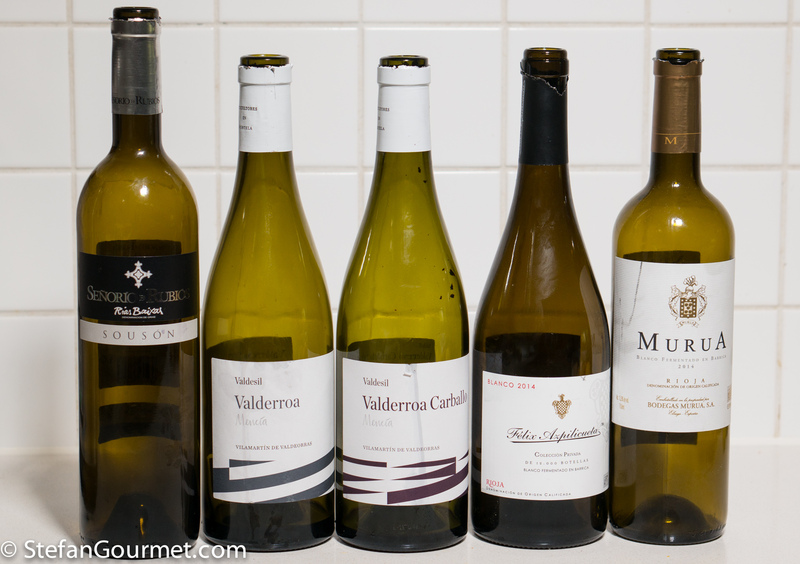 Beuatiful tapas. I’ve enjoyed croquetas many times at our local tapas place but never thought to attempt them at home. They actually look quite doable! For sure. But to be honest, jamón is one of the very few foods that the Spanish do better than the Italians. But only if you get the real thing (Bellota, acorn-fed, at least 10 euros for 100 grams, so more expensive than Parma or San Daniele). Next Next post: Sous-Vide With or Without Herbs in the Bag?